The Riviera Maya is comprised of the area just south of the tip of the Yucatan Peninsula in Mexico. It stretches along 75 miles of the Mexican Caribbean coastline in the southeastern part of of the Yucatan Peninsula. The weather is ideal; beautiful white sandy beaches and crystal clear blue waters make for a perfect vacation destination. The term Riviera Maya is fairly new and has varied definitions, but it starts approximately 10 miles south of Cancun at the seaside village of Puerto Morelos and includes places like Playa del Carmen, Puerto Aventuras, Akumal, and Tulum. It ends at the town of Carrillo Puerto. 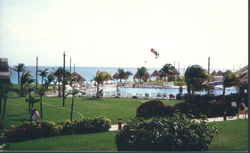 Along the Riviera Maya you will find at least four Eco Theme Parks. In other countries, like the USA, parks like these are usually provided and maintained by the State. In Mexico, concessions are granted to commercial interests to develop, maintain and profit (commercial) from these enterprises. This does not make them any less attractive, and provides much needed employment. The parks are located in protected bays, usually with stone, rather than sand under the water, this is not uncomfortable and makes for very clear, blue water. These bays or inlets are somewhat shallow, but flushed on a regular basis by the tides, making for much cleaner water than you find around resorts or municipal areas. You can rent snorkel equipment, inner tubes, rafts and such. These parks are excellent places to take a break from a day of exploring or driving in this warmer climate. Fish are plentyful and can be seen all around you. Avoid being in the middle of a feeding frenzy when someone buys and throws fish food into the water. Using cheese whiz, works well, but brings in bigger fish, who may nip at the fingers, so count that idea out. Xcaret, Set in a beautiful bayside location, this eco-archaeological park focuses on Mayan culture, with a restored Mayan archaeological site, traditional dance shows and a recreation of a Mayan village. The park has a host of other attractions as well, including a jaguar exhibit, a deer refuge, a regional wildlife farm, butterfly breeding facilities, a coral aquarium, a marine turtle conservation program, a wide range of flora, and opportunities for swimming and snorkeling. Xplor, This nature park has a number of limestone caves, grottos, and underground rivers for exploring on foot, on rafts, in amphibious vehicles, or by swimming. There are also some above-ground adventures to be had, including a 1.8-mile-long adventure whizzing you through the trees on 11 ziplines. Aviario Xaman-Ha  is a beautiful Aviary where you will find different species, not just birds, other animal species like the butterflies, iguanas, turtles and small mammals. The animals and plants that live here are in their natural habitat and they live in semi-captivity. There are endemic, threatened and endangered species. Tres Rios Nature Park  is an ecological park in the Riviera Maya located inside the Hacienda Tres Rios Resort where three rivers converge and flow into the Caribbean Sea. The eco-friendly environment stretches across 326 acres of lowland jungles and subtropical mangroves. The nature park is an untainted and protected nature reserve that offers tourist the opportunity to kayak, snorkel, swim, bicycle and dive, while interacting and connecting with nature in unique and uncultivated ways. Due to the construction of Cancun International Airport, this has become a popular and fairly inexpensive area to visit. One can fly in, pick up a car and explore the Yucatan Peninsula very easily. Most who visit the Riviera Maya are staying at all inclusive resorts and are transfered from the airport to the resort along this path by bus or shuttle to their accommodations. It is a wonderful place for families or single visitors to visit. Tourism is the main industry and visitors are treated very well (almost too well). If you never leave the resort, you will likely be quite happy. If you choose to explore, it is a 75 mile road, so you can be home by dark (make that: be home by dark). The official language is Spanish, like in the rest of the country. In the tourist areas, many locals also speak English, and some others French, German and Italian, as this area receives tourism from those places. However, some locals trace their heritage to the Mayans who settled the area before the arrival of the Spanish. The present-day Mayans tend to live inland and speak little Spanish. The nearest international airport to Riviera Maya is the Cancún International Airport  (IATA: CUN, ICAO: MMUN), the second busiest airport in Mexico. Receives international flyers from most large Western Hemisphere airports and several major European gateways, though there are no non-stop flights to Asia or Australia. Rio Secreto,  discover one of the most incredible natural marvels found in the Riviera Maya. 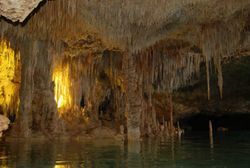 Rio Secreto is an underground labyrinth of endless passageways formed by ageless geological processes. Be transformed by this ancient, magical subterranean world that until now has remained unexplored for millions of years. Scuba Diving, [Always Diving].Amazing dive experience in cancun, diving lessons and professional diving guide in the best dive spots in Cancun Quintana Roo. The Riviera Maya is filled with all-inclusive hotels where the types of food varies from day to day, but you can count on a variety of international dishes from Italian, Argentine, and Continental as well as local Mexican dishes. There is nothing like getting out and tasting the local flavors, which you won't get in the all-inclusive hotel restaurants. Yucatan has a cuisine all its own and of course cities like Playa Del Carmen or Cancun enjoy a melting pot of both Mexican and International cultures who each bring their own flavors to their restaurants. You can find intimate restaurants with French or Italian cuisine dotting the city as well as Argentine steakhouses, and almost everywhere you will find typical American foods as well as Mexican food. One should take care when driving, as you will be sharing the road with cars, trucks, cattle, and people. Take care and use caution and you should be fine. Driving after dark is a bad idea; there are too many ways to have problems! The Policia are friendly, so treat them with respect. Plan on being stopped at state borders and your vehicle may be searched. Just go along with it. The Federal Police, a/k/a Federales, patrol the area and they are a serious bunch. Be polite with them and do not photograph them, any military vehicles, or establishments. Due to problems in the past, spring breakers are not the favorite visitors with law enforcement. Don't push their buttons. Behave like an adult and you will have few problems. Behave like a drunken fool, and you may regret it for a long time. The same goes for most places. This page was last edited on 21 February 2019, at 00:39.